The compact class now became known as the “C-Class”, and it was under this new name that Mercedes-Benz introduced the successor to the 190 model in May 1993. 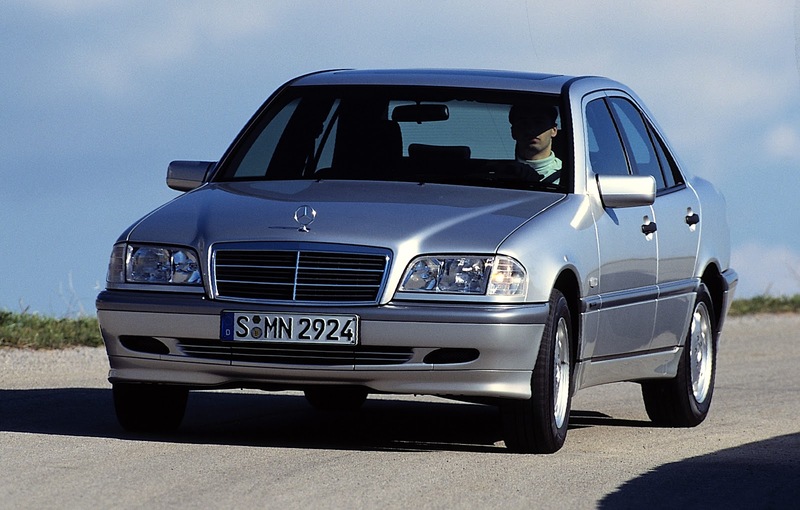 This meant that the W 202 series was presented under a generic name analogous to the S-Class (named as such since 1972) and E-Class (which was not given this name until summer 1993). The model designations of the compact class were thus brought into line with the Mercedes-Benz standard: a three-digit number indicated the displacement, and the letter “C” before the number showed the model series origin. The “E” previously used to indicate an injection engine was no longer required, since for the past three years this had been the only technology used in Mercedes-Benz petrol-engined passenger cars. And the code for diesel models now included the word “Diesel” rather than just a capital “D”. In comparison with its predecessor, the new car had softer external lines and significantly more space in the interior, along with improved active and passive safety features. Comfort was noticeably enhanced, even though the external dimensions remained virtually unchanged. Standard equipment now included a full-size driver airbag, integral side impact protection, ABS, power steering, five-speed transmission and central locking. Yet prices were only slightly higher than for the 190 model. Mercedes-Benz then proceeded to expand the range of body and equipment variants for the C-Class. 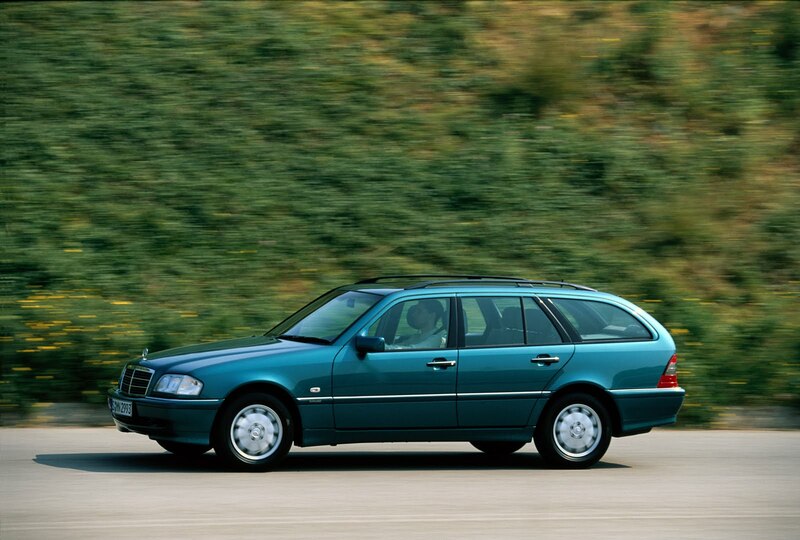 The Saloon introduced in 1993 was followed by the C-Class Estate in 1996. This S 202 series was a sporty and compact workhorse, matching the Saloon in terms of safety, comfort and environmental compatibility. The new Estate’s total load compartment volume of between 465 litres (loaded up to the lower edge of the rear screen with five passengers) and 1,510 litres (maximum load, up to the roof) was unprecedented in its class and set new standards. And the standard of safety was just as high: in a frontal impact, the Estate performed in the same way as the Saloon, but it was even safer in the event of an impact from the rear. Special structural design measures also increased protection in the case of a side impact. Another innovation was the concept of different design and equipment lines: alongside the classic version, which from 1995 was actually called CLASSIC, three other variants were available: ESPRIT, ELEGANCE and SPORT. The most popular were the CLASSIC and ELEGANCE versions. These three variants accounted for about a third each of the cars sold. The ESPRIT particularly targeted younger buyers: the suspension was lowered by 25 mm, and the interior featured vivid colours. ELEGANCE models were clearly more luxuriously equipped, and had colour-coordinated trim and chrome inserts on wheel embellishers, protective panelling and door handles, for example. Other details included transparent glass covers for the front indicators and bi-chromatic rear lights. The SPORT variant was also 25 mm lower, had a tauter suspension and came with wide tires as standard, with five-hole alloy wheels. An equipment package offered by AMG for the new C-Class further enhanced the dynamic appeal of the car. Features included a lowered sports suspension, alloy wheels in a special AMG design, modified front and rear spoilers, and discreet side skirts. Right from the start of the W 202 series, this diversity of equipment alternatives was matched by an extensive range of models, including four petrol and three diesel engines. 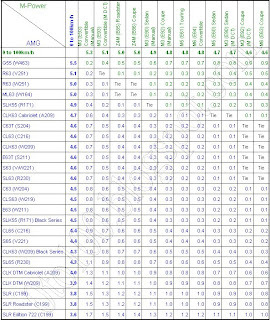 Power ratings for the petrol-engined models were 90 kW (122 hp) for the C 180, 100 kW (136 hp) for the C 200, 110 kW (150 hp) for the C 220, and 142 kW (193 hp) for the C 280 with its six-cylinder in-line engine. On the diesel side, the entry-level model was the C 200 Diesel, with 55 kW (75 hp), followed by the C 220 Diesel, delivering 70 kW (95 hp), and the C 250 Diesel with a rating of 83 kW (113 hp). Right from the launch of the new model series in 1993, this impressive fleet provided a significantly wider choice than had been available on the introduction of the first compact-class saloon eleven years earlier. Most of the petrol engines were closely related to the four-valve engines used in the 124 series of October 1992. The only entirely new design was the engine of the C 180 with four-valve technology and an electronic injection system with pressure sensor. Where diesel engines were concerned, the designers adopted the two-litre unit from the predecessor series. Two newly developed engines, the OM 604 (2155 cc) and OM 605 (2497 cc), were a world premiere by Mercedes-Benz – the first-ever diesel engines with four-valve technology. This represented a decisive advance in diesel technology since the use of four rather than two valves generated higher torque and power over a significantly larger engine speed range, and cut fuel consumption under full load by up to 8 percent. The enhanced combustion process also reduced particulate emissions by around 30 percent. Exhaust gas recirculation and an oxidation catalyst were standard equipment. The first model year of the C-Class culminated in the launch of the top-of-the-range C 36 AMG, presented at the Frankfurt International Motor Show in September 1993. The new model was powered by a 206 kW (280 hp) six-cylinder 3606-cc engine with four-valve technology, developed by AMG from the proven 3.2-litre engine. Production of the C 36 AMG started in early 1994. The elegantly designed C-Class was well received by customers and the trade alike, and the 500,000th unit rolled off the assembly line as early as February 1995. At the Frankfurt International Motor Show in September that year, Mercedes-Benz introduced a revised model series. The CLASSIC equipment line was now included as a fourth variant. All lines were given an enhanced interior, and fitted with 195/65 R 15 tires. At the same time, the front track was widened by six millimetres. When Mercedes-Benz introduced the C 230 Kompressor model in 1995, it was harking back to the brand’s proud record in bygone decades. After more than 50 years, the company was again fitting cars with a Roots blower. This supercharger boosted the output of the spark-ignition engine to 142 kW (193 hp), achieving the same performance as the six-cylinder C 280 model. The main effect of the supercharger was to provide significantly higher torque over a wide engine speed range. This provided outstanding acceleration and high flexibility, without any major increases in fuel consumption or pollutant emissions. For exports to Italy, Greece, and Portugal, the company also developed a two-litre variant of the supercharged engine. Mercedes-Benz also presented a turbocharged diesel engine: the C 250 Turbodiesel was the first turbodiesel passenger car with four-valve technology and charge-air cooling. The new model, with an engine developed on the basis of the proven naturally aspirated four-valve unit, delivered 110 kW (150 hp) and a maximum torque of 280 Newton metres, available from an engine speed as low as 1800 rpm. This put it among the most powerful cars with compression-ignition engines in its category. At the same time, the car excelled in high fuel economy and low emissions. Upon the arrival of the new turbodiesel, the C 200 Diesel and C 250 Diesel models were removed from the product range for the domestic market. Another C 200 Diesel model appeared in June 1996, but this car was powered by a new two-litre four-valve engine delivering 65 kW (88 hp). This model was exclusively manufactured for the Portuguese market. From August 1996, the company started supplying a special taxi version based on the C 220 Diesel. Its derated engine with 55 kW (75 hp) was optimized for use with the alternative vegetable oil methyl ester fuel. 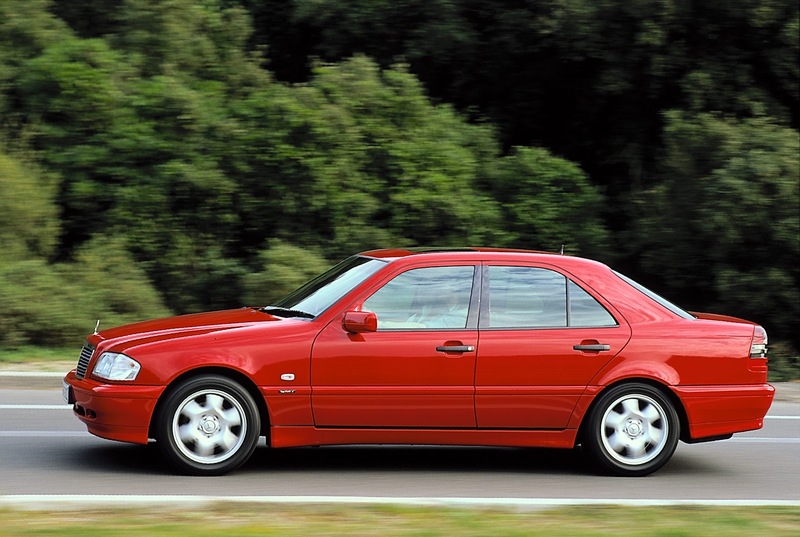 In 1996, the C 220 was replaced by the C 230, and the other four-cylinder petrol engines were modified and standardized. For example, the 1.8-litre and two-litre engines were now given an injection system using the HFM system with a hot-film air-flow sensor rather than the previously used pressure sensor, and also intake camshafts which were adjustable in operation. These modifications and the automatic five-speed transmission available from August 1996 resulted in lower fuel consumption, reduced engine noise emissions, even higher reliability and longer service lives as well as reduced maintenance costs. In 1996 Mercedes-Benz entered new territory, both technically and in terms of automotive body design, by introducing a sporty estate in the compact class. The estate was available in the same design and equipment lines as the Saloon: CLASSIC, ELEGANCE, ESPRIT and SPORT, and the cars were built alongside the saloons at the Bremen plant. The engine range initially included three petrol and two diesel units: the C 180, C 200, and C 230, and the C 220 Diesel and C 250 Diesel, plus the C 200 Kompressor and C 200 Diesel export models. 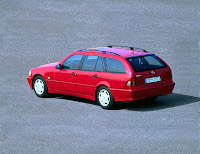 Revised engines were introduced in May 1996 for the Estate, and in August of the same year for the Saloon. 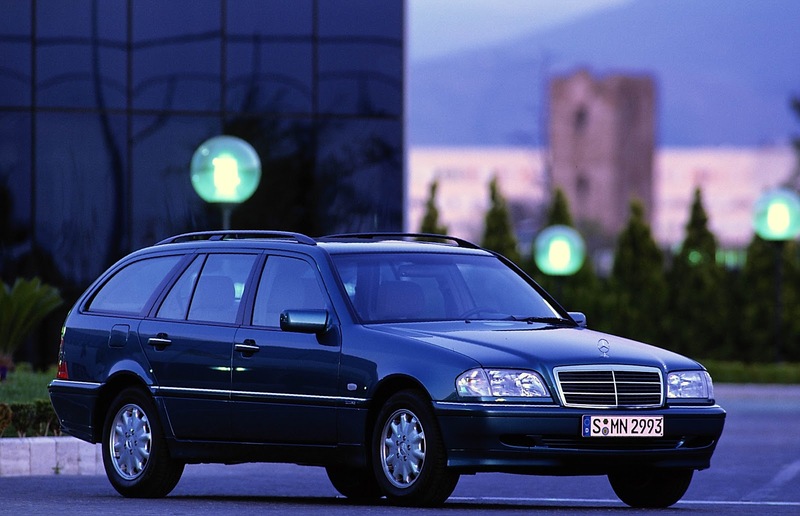 Also in August 1996, Mercedes-Benz introduced the Estate model for the taxi version of the C 220 Diesel, running on vegetable oil methyl ester. 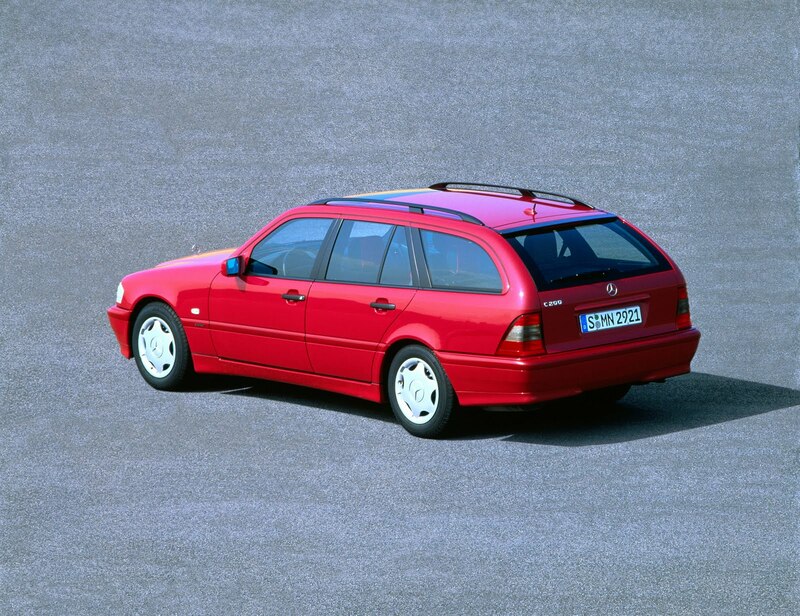 Both the Saloon and Estate emerged from a refinement in June 1997 with revised design, more extensive standard equipment and state-of-the art technology. At that point in time, Mercedes-Benz had sold over one million cars from the 202 series. The main focus of the refinement was on two newly developed V6 engines, with displacements of 2398 cc and 2799 cc, respectively. The 125 kW (170 hp) C 240 replaced the C 230 four-cylinder model for the domestic market, representing an inexpensive entry-level model in the six-cylinder segment. The 2.8-litre engine replaced the former C 280’s proven six-cylinder in-line engine in the C-Class. Both V6 engines were produced in the new state-of-the-art engine factory in Bad Cannstatt. Their innovative design and advanced materials made these engines light, clean, and economical. Emissions were further reduced by the use of three-valve technology and dual ignition. The Estate was now sold with these two V6 variants, and also as a C 230 Kompressor. The latter’s supercharged engine was already familiar from its use in the Saloon, and was now also available in an estate for the first time on the domestic market. The 1997 refinement also included modifications to the external appearance of both the Saloon and Estate: new front and rear bumpers, sporty side skirt panels painted in the same colour as the car body, dark rear lights, and a slightly modified radiator mask, all of which further emphasized the dynamic image of the C-Class. The interior was enhanced with new door trim and seat covers. The standard equipment was also significantly upgraded, including side airbags in the front doors, belt tensioners with belt force limiters on the front seats, and electronic Brake Assist. All the refined C-Class models – apart from the C 220 Diesel and C 180 as entry-level models – were now fitted with ASR acceleration skid control as standard. Other features new to the C-Class were the ELCODE Mercedes-Benz driver authorization system, and the newly introduced ASSYST active service system. New optional equipment features included the PTS electronic parking aid (Parktronic) and the APS auto pilot system, plus a variable cruise control system (only in combination with automatic transmission), a rain sensor for the windshield wipers, and xenon headlights with dynamic range control. Two more C-Class models made their debut at the Frankfurt International Motor Show in September 1997. The C 43 AMG took over as the successor to the C 36 AMG of which as many as 5,221 units had been built through to June 1997. Its newly developed 225 kW (306 hp) 4.3-litre engine was a V8 with a cylinder bank angle of 90 degrees, featuring three-valve technology and dual ignition. An automatic transmission transferred engine power to the road. Standard equipment included automatic climate control and the ESP® Electronic Stability Program. The car had an (electronically limited) top speed of 250 km/h, with acceleration from standstill to 100 km/h in 6.5 seconds. The C 43 AMG was the uncontested top model of the series – and the first C-Class model now to be powered by an eight-cylinder engine. In 1998 an even more powerful AMG model in the series was launched. It was powered by a V8 engine with a displacement of 5439 cc, which accelerated the car from standstill to 100 km/h in 5.5 seconds and gave a power output of 255 kW (347 hp). 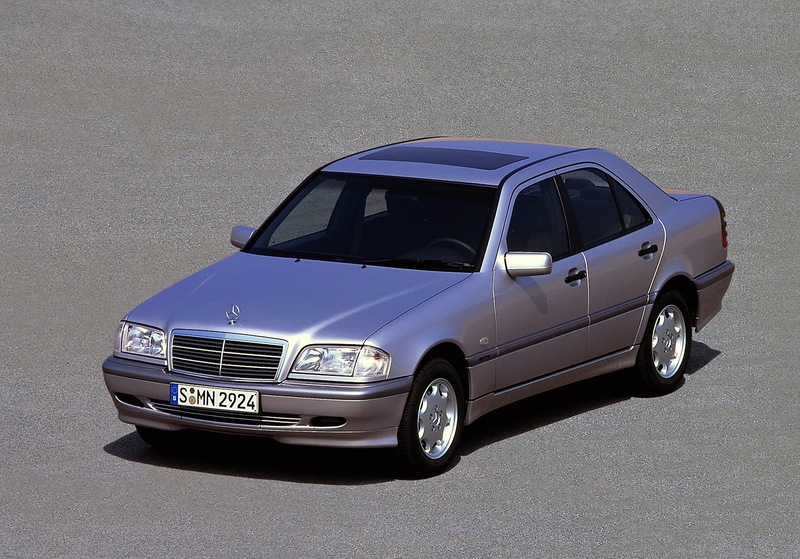 The C 220 CDI launched at the Frankfurt International Motor Show in 1997 did not provide the same level of power as the C 55 AMG – but it was still a major milestone in that this C-Class model was the first Mercedes-Benz with a direct-injection diesel engine based on common rail technology. Its 92-kW (125-hp) OM 611 four-cylinder engine developed a highly respectable torque of 300 Newton metres from an engine speed as low as 1,800 rpm. As a result, the C 220 CDI was the torquiest diesel car in its displacement category and also set new standards in fuel consumption and pollutant emissions. This model marked the beginning of the Mercedes-Benz success story with CDI technology – and again put the C-Class at the forefront of technical innovations. At the heart of the C 220 CDI was a common rail system developed jointly with Bosch, with several significant differences from other direct injection systems. Whereas conventional systems generate the pressure for each injection process as a separate operation, CDI engines use a “common rail” in which the pressure is stored and distributed to the injection nozzles via solenoid valves. The availability of high injection pressure of up to 1,350 bar available from low engine speeds and variable injection control result in a much improved mixture preparation process and therefore lower fuel consumption and exhaust emissions. The C 220 CDI was launched into the market in December 1997, to be followed in June 1998 by the C 200 CDI as the next CDI model, replacing the C 220 Diesel powered by a naturally aspirated engine with prechamber combustion. The new model was equipped with a derated version of the engine used in the C 220 CDI, with the same displacement. The new model was distinguished from its predecessor, first and foremost, by its high torque in the lower engine speed range, significantly improved performance and lower fuel consumption and exhaust emissions. The C 220 Diesel was now available only as taxi variant with derated engine. The 202 series produced a string of innovations and technical advances that made it a worthy successor to the 201 series. Mercedes-Benz continued to make the running with the second-generation C-Class, for example with new engine technologies such as CDI, or the offer of four distinct equipment lines. As noted at the launch of the third C-Class model by Dr. Dieter Zetsche, then a member of the Board of Management of DaimlerChrysler AG, later to become Chairman of the Board of Management at DaimlerChrysler and head of the Mercedes Car Group: “This sort of product concept was completely unprecedented in the automotive industry at that time. And it was a success right from the start.” In the period from 1992 to 2001 a total of 1,626,383 Saloons from the W 202 series and 243,871 Estates from the S 202 series were built.